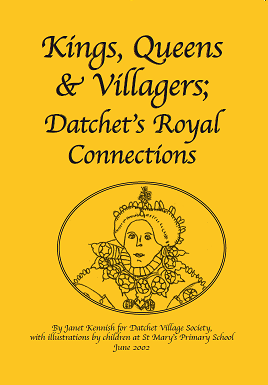 There is also a souvenir booklet, ‘Kings, Queens and Villagers’, written by Janet Kennish and first published by Datchet Village Society in 2002 for Queen Elizabeth II’s Golden Jubilee. 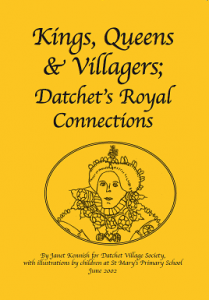 It traces Datchet’s Royal Connections right back to the Domesday Book and includes illustrations by children who attended St Mary’s Primary School at that time, price £2. 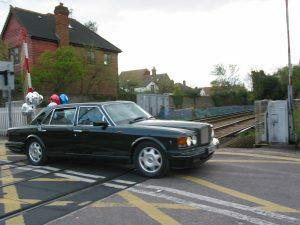 If you’d like to order a copy, please get in touch. 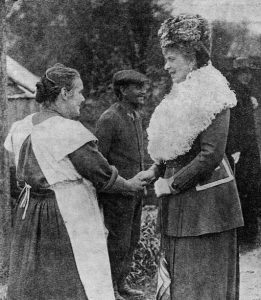 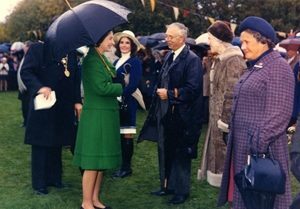 King George V and Queen Mary (our Queen’s grandparents) were taken by their friend Sir Lionel Cust of Datchet House to inspect the new Allotment Cottages in Ditton Road. The Queen is talking to Mrs Susan Lewin and hearing about her 14 children, including five sons who had returned safely from the war. 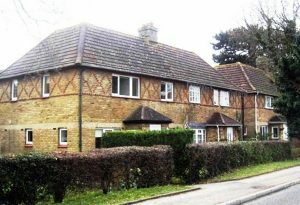 Ted Mount (centre), also lived in one of the cottages. 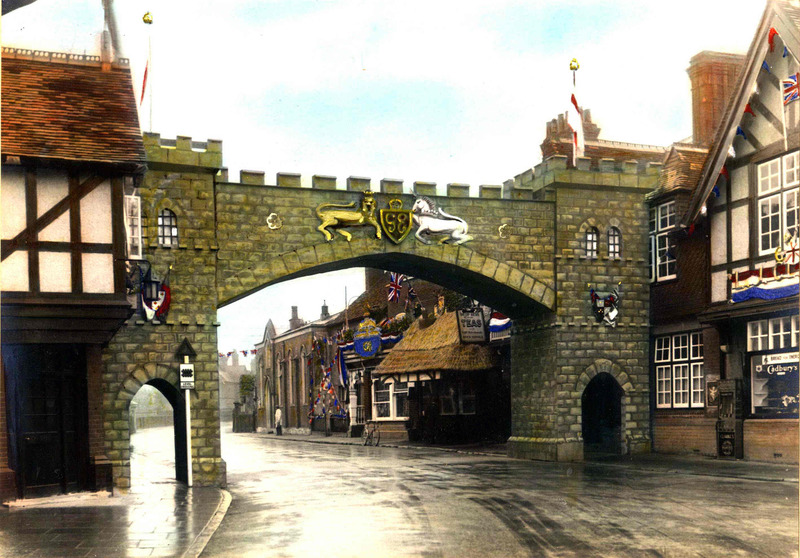 This wonderful temporary arch was built in secret by Nelson Masters and painted by Fred Avis, so that the whole village woke up on the day of the Coronation to a fantastic surprise. 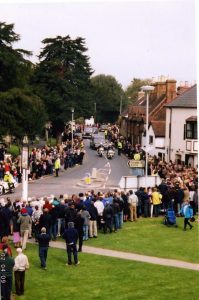 It spanned the top of the high street from the Manor Hotel. 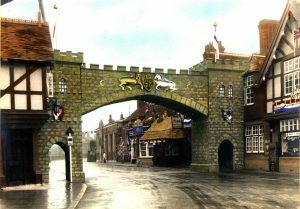 There is a very long tradition of building replica or theatrical architecture like this for special occasions, including several Victorian arches built in Windsor, but this was the first one in Datchet. 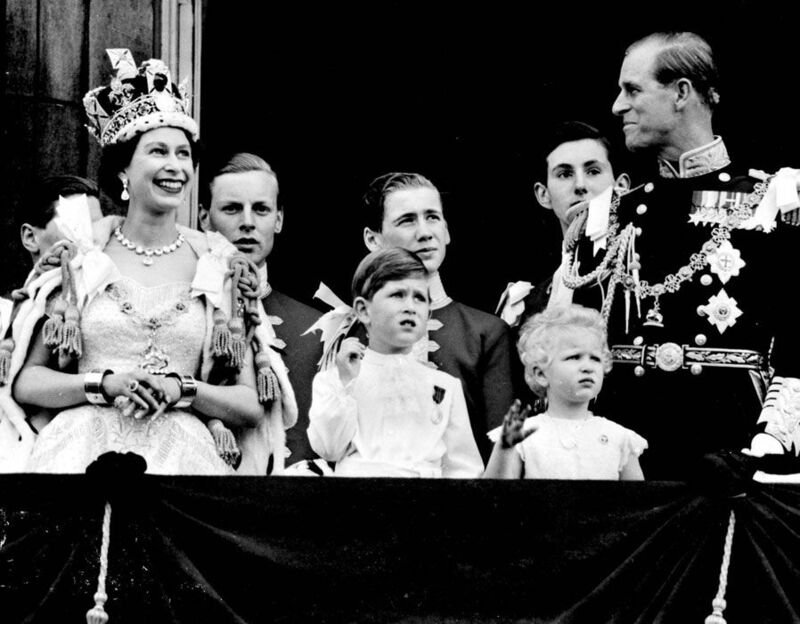 King George VI was one of George V and Queen Mary’s sons. She is in the middle of this Coronation photo taken at Buckingham Palace, with George VI, his wife Elizabeth (who we called the Queen Mother) and their daughters Princess Elizabeth and Princess Margaret. 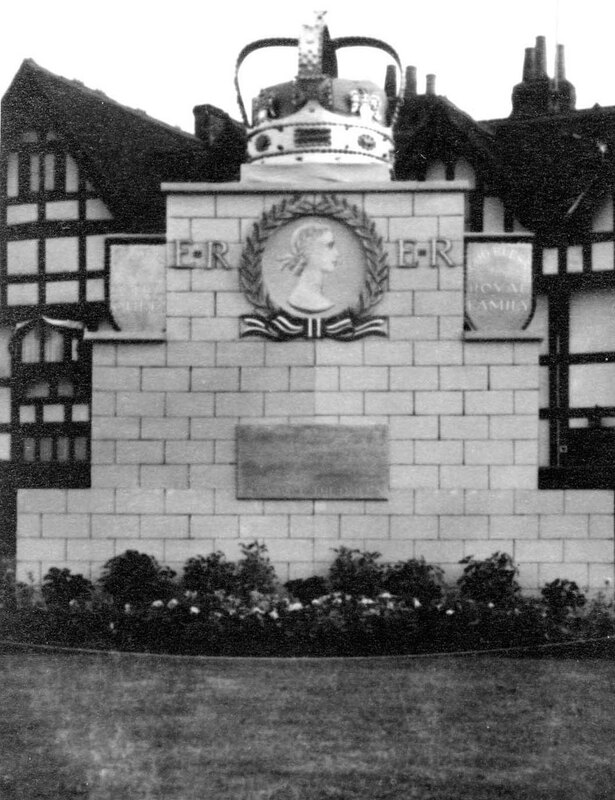 The Home Guard was stationed in the stables of Datchet House and also, it is said, at the Royal Stag very nearby. 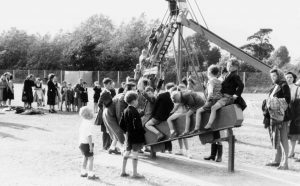 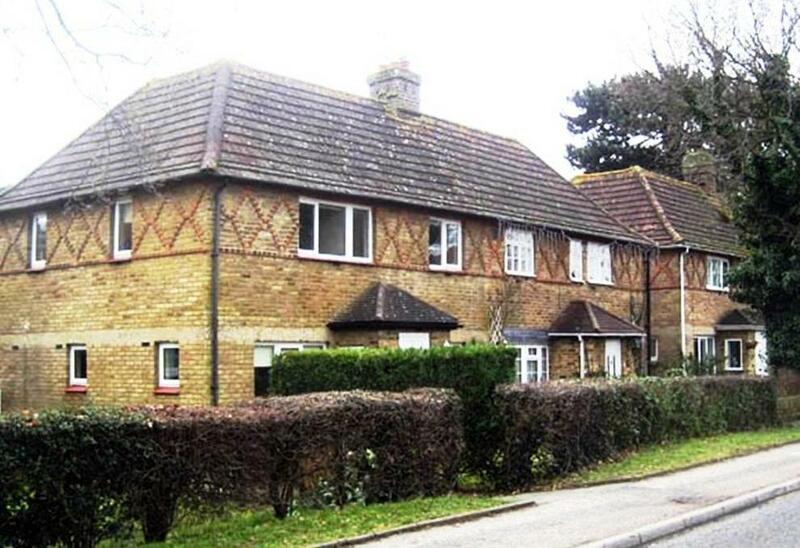 After WWII there was a national move to provide more playing fields or recreation grounds, and in 1950 the huge Marshfield (its medieval name) was compulsorily purchased for Datchet. 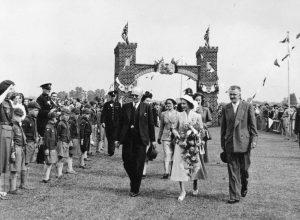 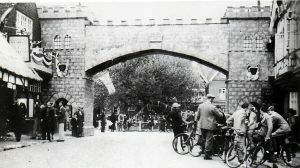 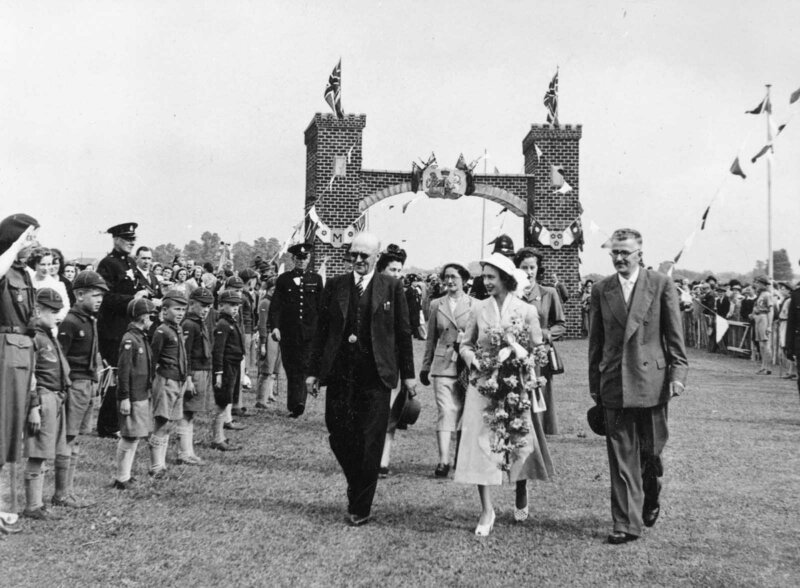 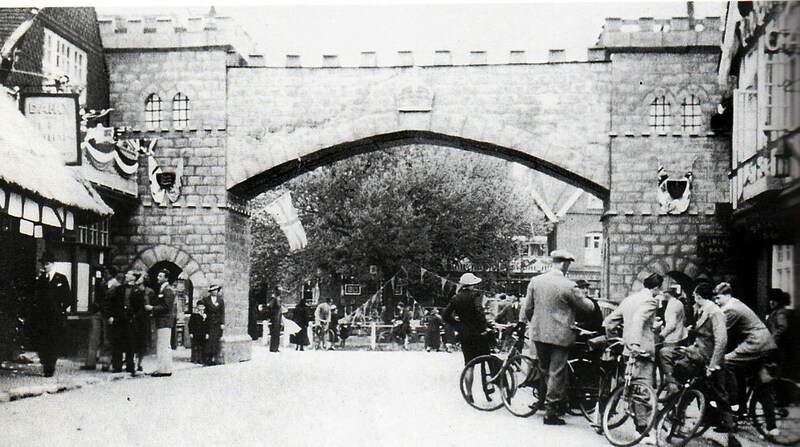 Another celebratory arch was built for the opening occasion, through which Princess Margaret walked with Charles King, Chairman of the Parish Council (on right) and Major Soden (on left). 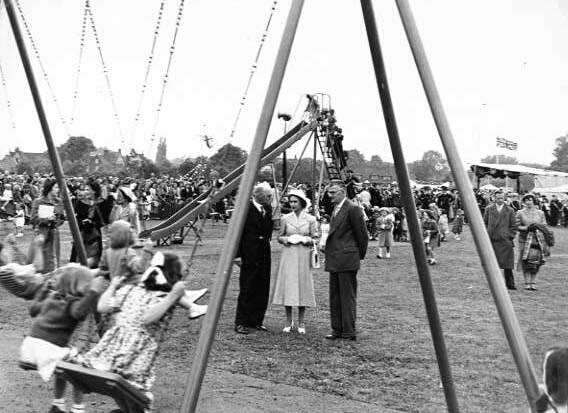 She attended a dance performance, visited handicraft displays by the Women’s Institute, and watched children playing on the new swings, seesaw and slide. A rather strange ‘stone’ monument was built on the Green for our Queen’s Coronation, with a huge crown on the top. 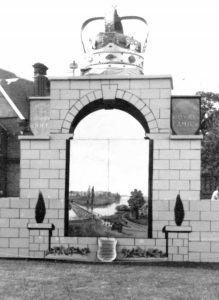 On the back of it, facing the Manor Houses, was a painting of the first Datchet Bridge which was built in 1706 by Queen Anne. 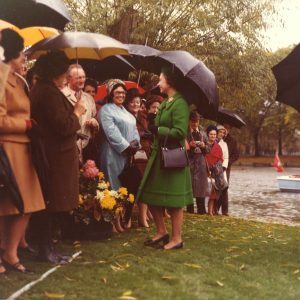 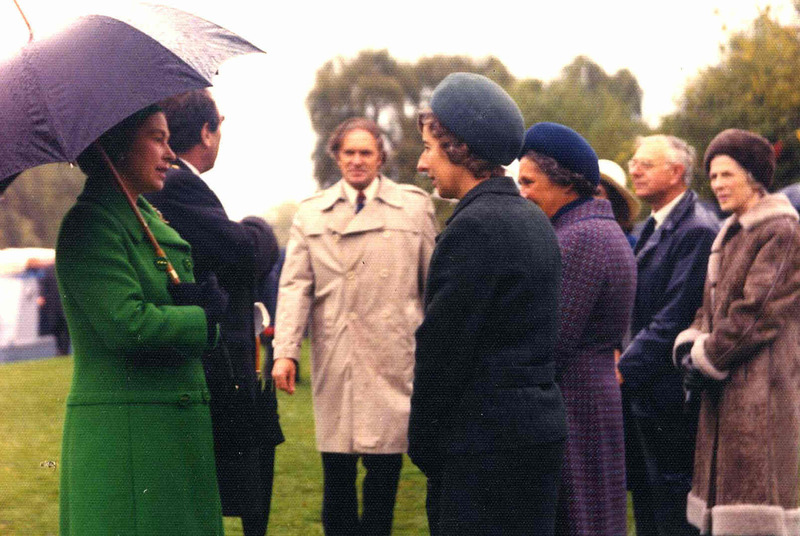 In 1974 local government changes brought Datchet into the new Royal Borough of Windsor & Maidenhead, and the Queen made a Royal Progress by river launch along the Thames, stopping off at towns and villages along the way. In terrible weather, Nelson Masters’ river garden on Southlea Road was used for the event. The Queen met Parish Councillors and representatives from village organisations, including Mr Masters and Barbara Street. In reply to a query about her wet feet, the Queen replied that she had spare dry shoes on the launch. 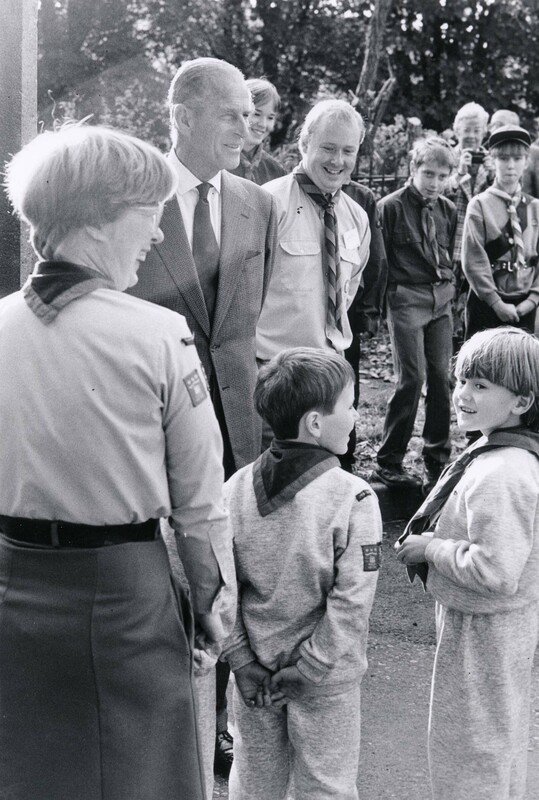 Prince Philip came to open 2nd Datchet Scout’s headquarters in Green Lane, to which he had contributed funds. 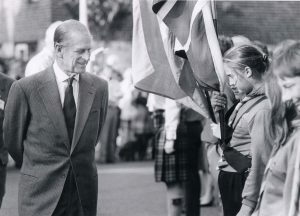 It was Dave Smith who escorted him around, and the Duke put his fingers in his ears when aircraft noise almost drowned out his speech at the opening ceremony. Afterwards he watched boys cooking over a camp fire and showed that he could still tie the complicated knots they were learning. 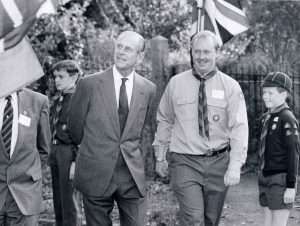 Brownies and Guides took part as well the Scouts, Cubs, and Beavers. 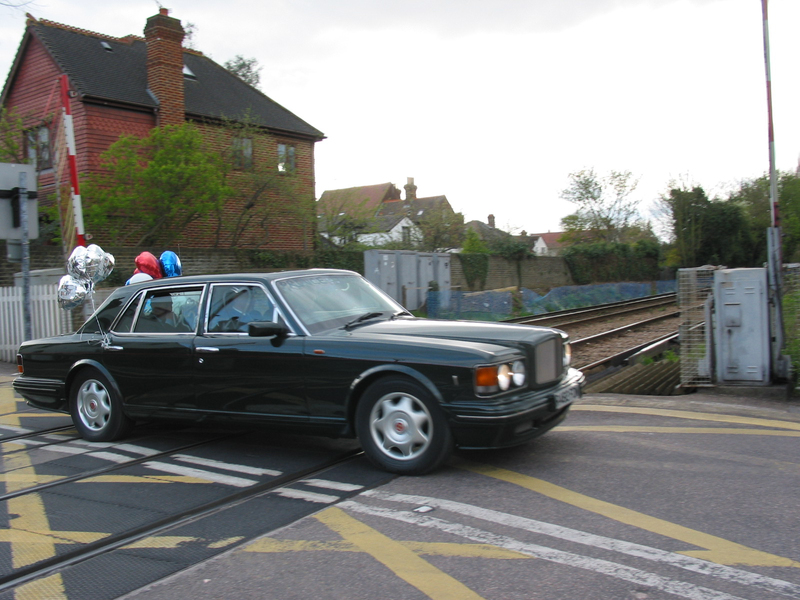 On 9 April 2002 huge crowds watched the Queen Mother’s hearse and funeral cars travel slowly through the village on their way from London to Windsor. 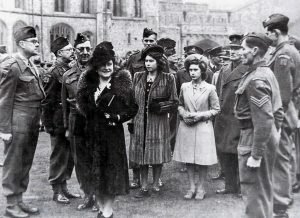 The funeral service had been held in Westminster Abbey, and the burial was to be in St George’s Chapel at the Castle. 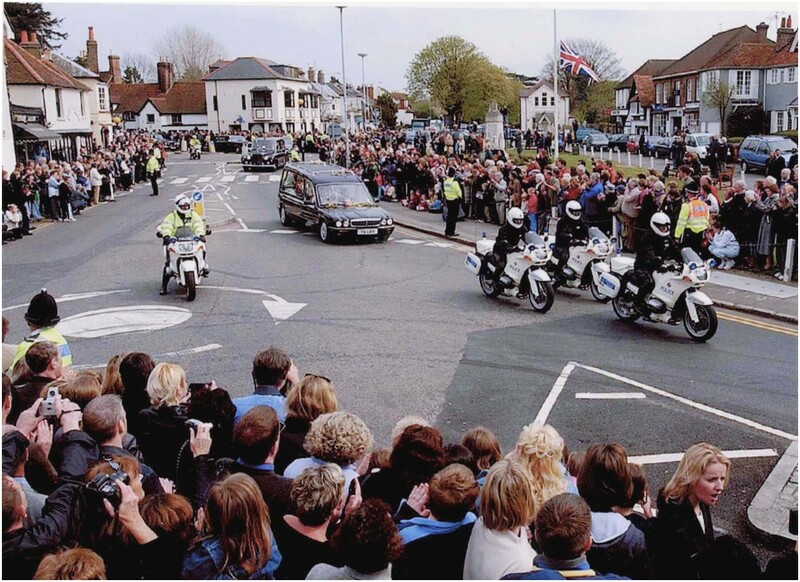 Everybody who could be there was out waiting, including children from the school, and the whole occasion was a deeply moving and impressive one. 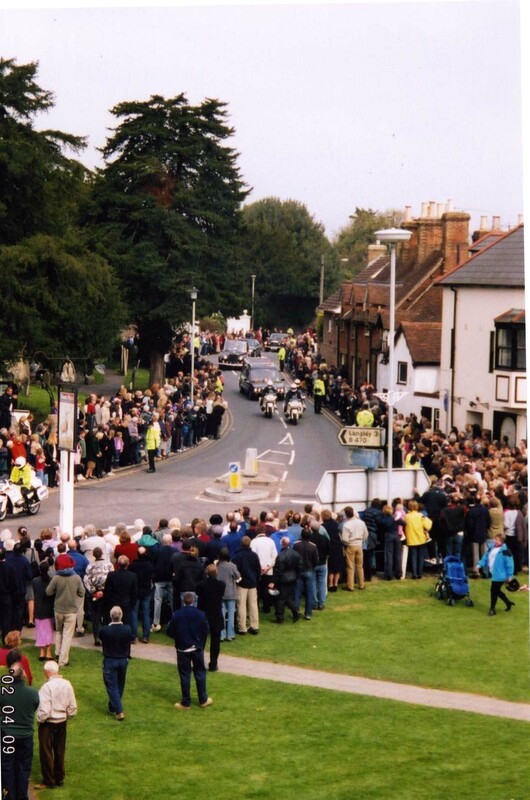 It was also a day when images of Datchet flew around the world, as media organisations realised what a photogenic vantage point the village provided. 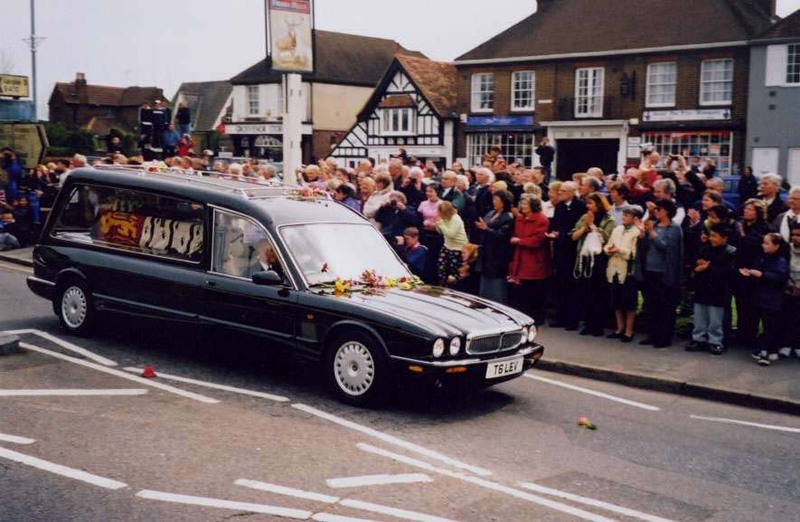 Members of the Royal Family often drive through the village between Windsor and London, usually with very little ceremony and scarcely noticed by people they pass. 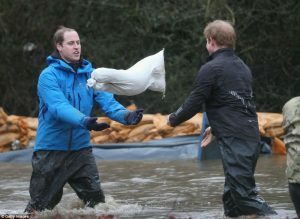 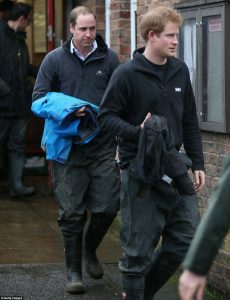 Princes William and Harry stepped in to help a platoon of soldiers from their own regiment, the Household Cavalry, who were using sandbags to fill the breach in the flood bank along the railway line. 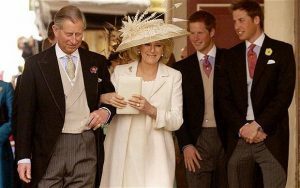 Having intended this to be a discreet and private relief effort, it was not long before the princes were spotted, adding further excitement to the drama already being followed by the world’s media. For once this was a Royal visit with no ceremony at all. William and Harry worked alongside other flood rescue services and local officials based at the Parish Office, chatting to people they met although preferring to keep out of the limelight. The DVS Photo Archive is the source of most of the photographs on display here. This unique set of images has been collected and managed for many years by Rob Gordon and more recently by Adrian Giddins. Please ask if you’d like to know more.